A growing number of pollinator species that are key to the world’s food supply are headed towards extinction, warns a new United Nations report – the first global assessment of pollinators. “If pollinator declines continue at this rate it will have serious implications not just for human food security and economics but also for biodiversity and the health of ecosystems in general,” says Berry Brosi, an assistant professor in Emory’s Department of Environmental Sciences and one of the lead authors of the report. 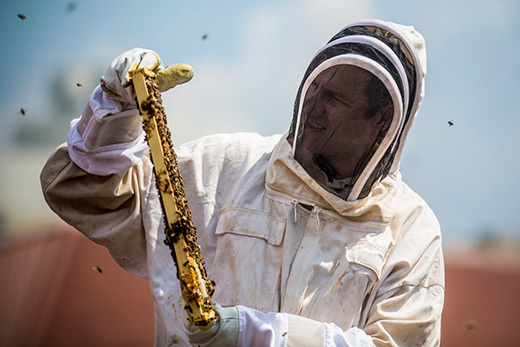 Brosi, a biologist and ecologist whose research focuses on both managed honeybees and wild bees, was among 77 international experts who worked on the pollinator assessment for the U.N.’s Intergovernmental Panel for Biodiversity Ecosystem Services (IPBES). They spent two years evaluating information from more than 3,000 scientific papers, as well as indigenous and local knowledge from more than 60 locations around the world. The summary of the report will be posted online February 29. Seventy-five percent of the world’s food crops depend on pollination by at least one of the 20,000 species of pollinators, including bees, butterflies, moths, wasps, beetles, birds, bats and other vertebrates. And yet, the report warns, more than 40 percent of invertebrate pollinator species, particularly bees and butterflies, face extinction. And 16 percent of vertebrate pollinators are under threat.